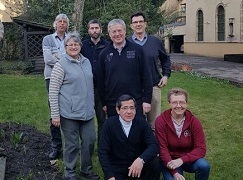 The Working Group on Social Ministry of the (CRE), held their annual exchange meeting from 12 to 14 March 2018 in the newly renovated monastery, which is located in the heart of the city of Luxembourg. Its multilingual pastoral and liturgical offerings are a magnet for the people. “It is always enriching and heartening to learn about others’ commitment,” says Fr. Winfried Pauly, former moderator of the working group. The group consists of Redemptorists, Missionary Sisters of the Most Holy Redeemer (MSsR) and lay workers. The General Chapter and the Communicanda 1 stress the importance of social ministry in its solidarity with the poor and the concrete approach to people who have been wounded for different reasons and have come to the downside of life. The working group invites all the people involved in and supporting social ministry in the CRE to advocate its relevance for the new apostolic plan, for example in the extra ordinary visits or other (international) meetings. In the meeting in Luxembourg, particular attention was given to the exchange of experiences in the continuing warlike conflicts in Ukraine, the care of predominantly single mothers in Vienna, the fate of migrant workers in Luxembourg and efforts for intercultural and interreligious dialogue in Bochum / Germany. Fr. Johannes Römelt, Coordinator CRE, enriched the meeting of the working group with his visit. He asked the group to continue the yearly exchange in the current Sexennium. The working group would like to see the other participants in social ministry contributing with their experiences. This invitation is valid both for those who are already active in this work and for them for whom this position and this way of acting in the Social Pastoral is something new. Interested people for the meeting in the coming year (probably March 2019), may contact Fr. Winfried Pauly. (winfried.pauly@redemptoristen.org).